GLFC's Marc Gaden talks about FishPass on Blue Fish Radio with Lawrence Gunther. Michigan State University and the Great Lakes Fishery Commission Name Dr. Chris Vandergoot as New Director of Leading Research Network. 2019 Sea Lamprey Control Program Treatment Schedule. 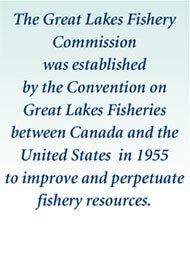 You are invited to the 63rd Annual Meeting of the Great Lakes Fishery Commission. Great Lakes St. Lawrence Collaborative Summit Registration Now Open. Celebrating 60 Years of Successful Sea Lamprey Control, Science, and Cross-Border Collaboration! Taking Lampreys on the Road! It's Getting Hot in Here! For decades, a heated debate has played out among a group of scientists concerning the nativeness of the sea lampreys in Lakes Ontario and Champlain. On one side lie five papers by two teams of geneticists and a zoogeographer asserting that sea lampreys are native to these two lakes. On the other side lie four papers, the first published in 1971 and the last this past year by the Great Lakes Fishery Commission's Randy Eshenroder, which reestablished the sea lamprey's classification as non-native to Lakes Ontario and Champlain. At the core of this debate is whether sea lampreys colonized these two lakes thousands of years ago at the end of the Ice Age or whether they dispersed into these lakes much-more recently through the Erie and Champlain shipping canals, which originated in the Hudson River at Albany, New York. Once established in Lake Ontario, sea lampreys were able to gain access to the other four Great Lakes. Within the Great Lakes and Lake Champlain, sea lamprey populations are controlled at considerable cost to encourage the recovery and productivity of fish stocks. If the sea lamprey is non-native, it would not receive the protection afforded native fishes in Lakes Ontario and Champlain. However, if native, its perpetuation would be assured, and, thus, populations would be kept at small but sustainable levels. Sea lampreys, which are native to the Atlantic Ocean, have long had access to Lake Ontario via the St. Lawrence River, which drains the lake (see Figure 1). 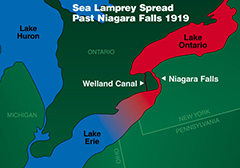 Once in Lake Ontario, whether through natural migration up the St. Lawrence River or through canal from the Hudson River, which formerly lacked a connection to the Great Lakes, all parties agree that the sea lamprey gained access to Lake Erie and then the upper Great Lakes through the Welland Canal, bypassing Niagara Falls (see Figure 2). According to Eshenroder, the genetic data offered in support of a native classification of sea lampreys in Lakes Ontario and Champlain were contradictory. For Lake Ontario, one team of researchers used a set of genetic markers that favored a native classification while another team used a different set that favored a non-native classification. As regards Lake Champlain, the genetic diversity of its population was found to be identical to that of Lake Superior's (in which sea lampreys are unquestionably nonnative). If native to Lake Champlain and, therefore, much older than the Lake Superior population, genetic diversity should have been greater in Lake Champlain. Further, in both Lakes Champlain and Ontario, the existence of rare genotypes was taken to be strong evidence of nativeness but these findings depended on untestable assumptions and can be readily explained by depletion of the formerly abundant Atlantic population. If sea lampreys were native to Lakes Ontario and Champlain, it was not among the fishes recognized by early naturalists, despite its habit of leaving gruesome wounds on the most valuable fishes like Atlantic salmon. Those advocating a native classification hypothesize these landlocked populations were small and undetectable before settlement, but then, owing to environmental degradation, were released, becoming destructive pests. The argument that undetectably small populations were released by environmental degradation was disputed by Eshenroder. He thought it unlikely that sea lamprey populations would expand after settlement, since settlement would have severely impaired their spawning habitat and food supply. 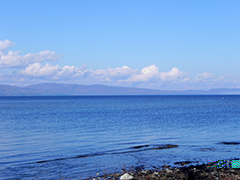 If the ecological-release hypothesis was plausible, in Lake Champlain (pictured right) the release should have occurred just after the late 1700s, following the end of the Revolutionary War, when the land around the lake was parceled off for settlement. The idea of ecological release was abetted by a mistake regarding when the first sea lamprey was observed in Lake Champlain. Those researchers advocating a native classification thought it was as early as 1841 or 1894. Eshenroder showed that these dates were in error and that the correct date was 1929. If the sea lamprey of Lake Champlain was released by settlement, it should have been abundant and detectable a century earlier. In short, the historical record did not support the hypothesis of ecological release nor of a native classification. The alternative scenario supported by Eshenroder's research indicates improvements to the Champlain Canal facilitated passage of sea lampreys into Lake Champlain (see image, right). Prior to 1916, the Champlain Canal was an artificial cut that diverged from the Erie Canal just north of West Troy, New York. The Champlain Canal then ran northward, crossing the Hudson River and one of its major tributaries. These river crossings were junctions where sea lampreys would have escaped the canal, continuing their migration in more-hospitable waterways. However, in 1916 the Champlain Canal was replaced by the Champlain Barge Canal which made large stretches of the Hudson River navigable for motorized barges. These improvements to the Hudson River and improvements elsewhere likely made the new canal suitable for sea lampreys to navigate all the way to Lake Champlain. According to Eshenroder, the engineering of the original Champlain Canal and the improvements of 1916, which created the Champlain Barge Canal, explain well why the sea lamprey was not observed in Lake Champlain until 88 years after, and not before, the original Champlain Canal opened. According to Eshenroder, the sea lamprey's appearance in the Lake Ontario drainage followed shortly the diversion of waters in 1863 from the adjacent Susquehanna River (a tributary of the Atlantic Ocean) into the Erie Canal. This previously overlooked diversion, intended to boost the supply of water into the improved Erie Canal, would have allowed the progeny of sea lampreys migrating upstream from the Atlantic Ocean to enter the Lake Ontario drainage near Oneida Lake. Sea lampreys were well known to be plentiful in the Susquehanna River and were found in Oneida Lake in the 1890s. Their invasion resulted in many accounts of lampreys attached to dying fish floating on the lake's surface. The arguments by Eshenroder in support of a non-native classification of the sea lamprey in Lakes Ontario and Champlain have, for now, the upper hand in this long-running controversy. Whether those advocating a native classification can buttress their case remains to be seen. In any event, the sea lamprey populations in Lakes Champlain and Ontario are considered to be above tolerable levels, calling for continued control efforts to preserve valuable fish stocks and lake economies. Limited access to Eshenroder's full article, "The Role of the Champlain Canal and Erie Canal as Putative Corridors for Colonization of Lake Champlain and Lake Ontario by Sea Lampreys," is available to AFS members and those with university-affiliation. To request a print copy, please contact info@glfc.org. Figure 1: Map showing the Erie and Champlain Canals, and their connections. A view of Lake Champlain from the coast as it stands today. According to the New York State Department of Environmental Conservation, sea lampreys are responsible for around 29.4 million dollars of lost economic benefit to businesses and residents in the Lake Champlain basin. 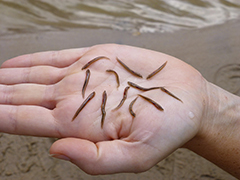 Sea lamprey in their larval stage, in which they are referred to as ammocoetes. It is during this stage that Eshenroder hypothesizes sea lamprey drifted down the upper Susquehanna River and entered a diversion which fed water into the Lake Ontario drainage near Oneida Lake. The significance of this diversion, discovered by Eshenroder during a trip to the Erie Canal Museum, was either unknown or overlooked by other researchers.